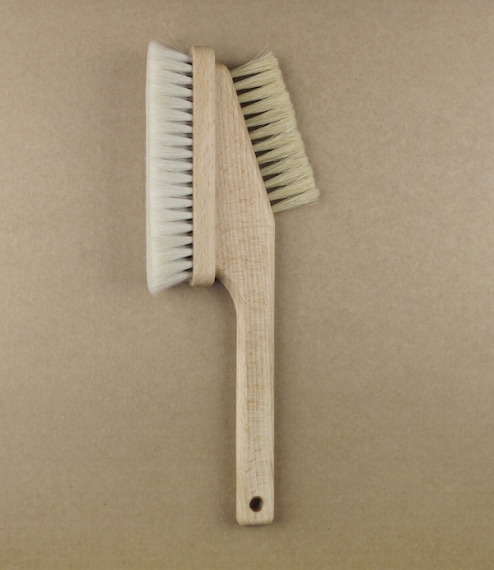 An interestingly shaped brush made of oiled beechwood fitted with two brush heads, one of soft goat hair for dusting especially screen, the other a single row of light bristles for cleaning between rows of keys and dusting tight crevices. From the workshops of the Redecker company, who since their founding by Friedrich Redecker in the 1930 have specialised in the production of unusual and high quality brushes, made using traditional techniques and largely natural materials. About 26.5cm long.